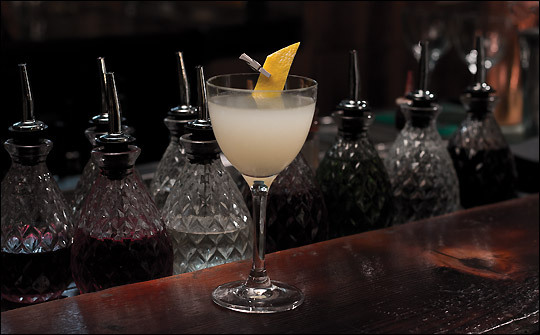 A simple twist on a gin sour, substitute the sugar syrup for orgeat, a French almond-based syrup usually found in rum-based tiki cocktails. First appearing in David A Embury’s The Fine Art of Mixing Drinks in 1948, it’s a refreshing drink that’s definitely more than the sum of its parts, orgeat making a great partner for gin. I suggest using a citrus-led London Dry like Beefeater, Jensen’s or City of London’s Square Mile. Or, if you want it to live up to the ‘navy’ part of its name, why not try a navy strength gin? Plymouth should just about do it. As far as the bitters go, I prefer to use orange rather than Angostura, as I find the flavours more complimentary. If you don’t have any bitters in your cocktail cabinet, don’t stress, it’s just as delicious without. Add all ingredients into a cocktail shaker*. Add plenty of ice and shake vigorously until chilled. Double strain** into a chilled martini glass or coupe. Squeeze the zest over the glass to express the oils from the skin over the surface of the drink. * If you don’t have access to a cocktail shaker, you can use any vessel that will seal airtight. Empty, clean jam-jars, NutriBullets, protein shakers, and even Tupperware containers will work, though pouring out of a Tupperware box requires a certain level of skill! ** Double straining involves the use of a hawthorne or julep strainer, however you can also use a tea strainer to catch any small shards of ice (which you will produce if you shake hard).